100 Year Old Orville Rogers "THE RUNNING MAN" WINS GOLD, breaks 5 new American & World Track records in the 60m, 200, 400m, 800m and 1500m races. Entire family in attendance cheers him on "GO ORVILLE GO!" 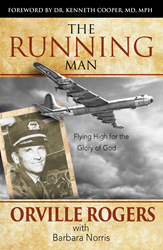 Pilot, philanthropist,world champion runner, and author of "THE RUNNING MAN: Flying HIgh for the Glory of God" Orville Rogers trained bomber pilots in World War II, flew the B-36 on secret missions during the Korean Conflict, ferried airplanes to remote Baptist missions all over the world, and managed to squeeze in a thirty-one-year career as a pilot with Braniff Airways. After retirement, he and Esther Beth, his wife of sixty-four--plus years, served thirteen months with the Baptist Mission in Tanzania. With her help on the ground, he flew goods and passengers to outposts largely inaccessible by land. Orville took up running at age fifty-one after reading the book "AEROBICS" by Dr. Kenneth H. Cooper, MD, MPH, and ran his first marathon six years later. At age ninety, just two weeks after Beth’s passing, he attended his first national meet, where he broke two world records. He holds fifteen world records to date and continues to compete annually. Invariably, he wins. He has two sons, Bill and Rick, and a daughter, Susan, as well as, nine grandchildren, and ten great-grandchildren. He lives in Dallas, Texas. FUN FACTS: He wears customized NIKE running shows, drives a Red Chevy Camero he purchased for his 97th birthday with "Beth 10" on the license plate in honor of his late wife who he always called a "10" and he loves to text message.